IP to IP translator app for SMPTE ST 2022. It's unique! Designed for making adjustments to IP flows, the flexible IP-IP-2022 is the product to help you solve those IP challenges. Plus it's future-proof – when this functionality is no longer required you can simply install a different low-cost app on your MARBLE-V1 hardware. Any applications where you need to make changes to network settings – such as network address translation, unicast to multicast address translation and the creation of media firewalls, as well as ST 2022-6 to ST 2022-7 protocol conversion. Try out the IP-IP-2022 VisionWeb demo (opens in new window) – you'll see how easy it is to operate the IP-IP-2022 app from your web browser, while exploring the full functionality of the product. could be the ideal product to solve them. With the ability to make changes to network settings, the IP-IP-2022 de-encapsulates and re-encapsulates video (up to six HD/SD or three 3Gb/s) between up to four bi-directional uncompressed 10GbE IP network interfaces, with flexible assignment of the flows to the networks. Supporting the SMPTE ST 2022-6 and ST 2022-7 protocols and 31 SDI video standards,the IP-IP-2022 includes full VLAN support with no restrictions. Whatever the packet distribution on the input, traffic shaping on the output will ensure that any downstream devices will accept the flow. The IP-IP-2022 has the flexibility to be useful in many applications. It can be used for SMPTE ST 2022-6 to ST 2022-7 protocol translation. 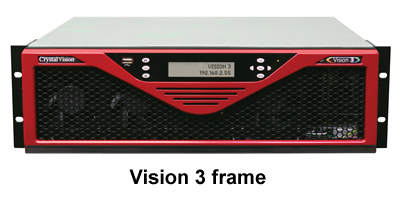 The future-proof IP-IP-2022 is a software app that runs on the MARBLE-V1 media processor – purpose-built video over IP hardware that fits in the Vision frames. Apps that are bought with the hardware can be replaced with different low-cost apps as needs change, helping you make the most of your budget. No other IP products make it quite so easy for your systems to grow and mature with the transition. There are six routers which allow clean switching of the network input flows to the network output flows. Any of the input flows can be routed to any output flow. Input flow sources are synchronised to a common reference timing source prior to IP encapsulation for clean switching of input flows to output flows. The IP-IP-2022 supports Precision Time Protocol (PTP) in addition to the Vision frame's two analogue references as a timing source, with user configurable options for timing source priority and redundancy. The chosen reference is the global reference source for all input flows and output flows. There are five options for the reference selection, selectable via VisionWeb. (See the Specification for full details.) Should the timing source at the top of the list become missing or invalid, the card will move down the list until it finds a valid timing reference source. The output timing can be fully adjusted with respect to the chosen reference using three time-based controls (0 - 42ms adjustable in 0.1ms steps, 0 - 100us adjustable in 1us steps and 0 - 1us adjustable in 5ns steps), with the selected timing alignment global to all output flows. An additional ten frames of video delay (adjustable in one frame steps) allows compensation for any big system delays and can be configured individually for each output flow. The IP-IP-2022 includes signal status monitoring for peace of mind. The status indications available are video present, video format, video black, video frozen, Reference 1 and 2 present, Reference 1 and 2 format, Reference 1 and 2 incompatible format, PTP master and backup clock present and audio groups present, with the IP-IP-2022 able to provide warnings of any problems via SNMP traps. The IP flow monitoring on the input flows includes packet loss, duplicated packets and packet delay variation. Fitting in the standard Vision frames (currently available in 3U size), MARBLE-V1 is a space-saving 96mm x 325mm card that sits in one frame slot – allowing up to ten media processors in 3U. The double slot VR05 frame rear module is used to access the inputs and outputs on the IP-IP-2022 app. For more visual technical information, download the IP-IP-2022 block diagram.